The first three weeks in September are pretty famous around these parts. It's fair time! The WA State Fair is such a big deal where we live, that kids (and teachers) get a half day of school on "fair day" and get free tickets for admission. This works well for our family because football practice is held at noon and the hubby was done in time to spend the afternoon/evening at the fair. We had such a great time doing all of the non-ride activities. I think the cows are a family favorite, so we usually head there first. Prepare yourself for a photo dump. I'm too tired to do anything with these, so I'm putting them all on here for your enjoyment. You're welcome. As a side note: I do love the convenience of the cell phone for pictures, but it has made me incredibly lazy! I hardly ever bust out my "nice" camera anymore. I need to do that more often! Because we told the kids no rides on fair day, I promised them that I'd take them a different day to get "dizzy passes". (Aka. ride all you want for $35). I may or may not have pulled my boys out of school early to take advantage of a 90 degree Monday. We had the best time. And hey, I never take my kids out of school for other things, so I don't have too much guilt. We met up with my sister and her boys, as well as my mom. She spoiled us rotten. As per the usual. I love that my nephew and Molly are just one month apart in age. They are perfect ride buddies! And, my mom is the coolest grandma and decided to get herself a dizzy pass to ride with my boys. What a score! Such fun was had by all. After about 3 hours, my mom and sister left, so I spent the last 2 alone with my kiddos. You know what? It went great! Better than I had imagined. The kids were well behaved, they listened and we had a blast. It is possible to take 4 kids to the fair alone. A special shout out to the sweet stranger who saved me by putting my screaming daughter on her lap and going down the giant slide with her. 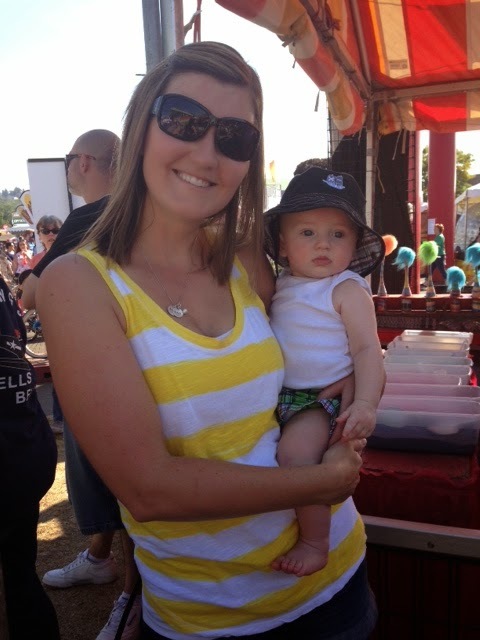 That's the one drawback about single parenting at the fair. I was helpless and she totally saved the day! See the sweet lady on the left, who is holding a crying little girl---who decided, once at the top, she wasn't coming down. Yeah, that was fun. I've been 3 times this year already, and am not sure if I'll be back again or not. It truly is one of my favorite places to be. There is something nostalgic about walking around a familiar place with familiar smells and sounds. We are blessed to grow up with this great tradition! And I'm going to forgive Kenny Chesney for cancelling his concert on Saturday night. I was really looking forward to it....but instead had fun eating dinner and walking around with some of my favorite girls.